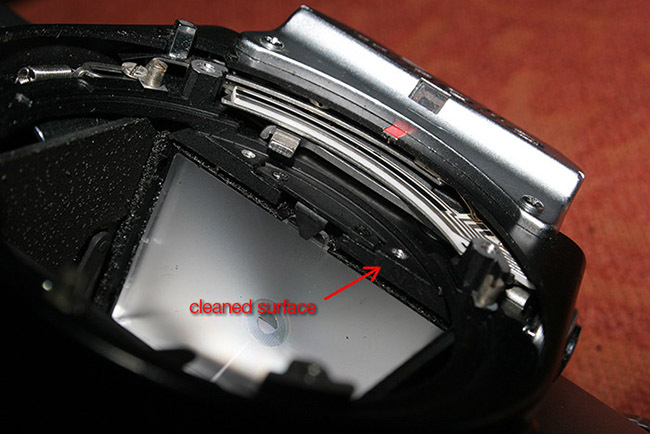 Whenever you get a new camera it's advisable to at least change the light seals if they're in a bad shape, including the mirror dumper foam. 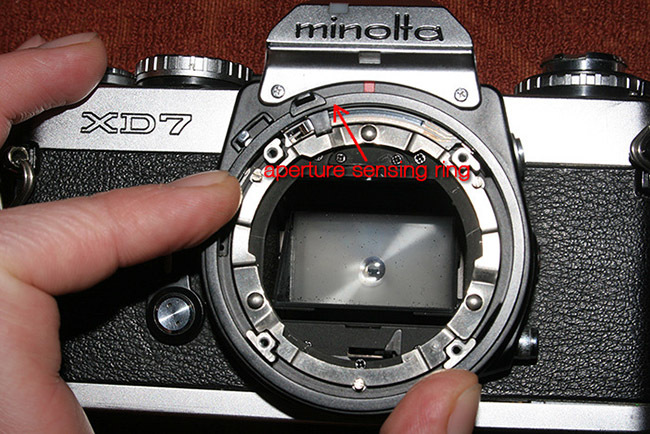 While this is a straight-forward operation in most cameras, the mirror foam on the Minolta XD-7 /-11 and probably some other models (I've only came across this one) needs a bit of tinkering to get it right. 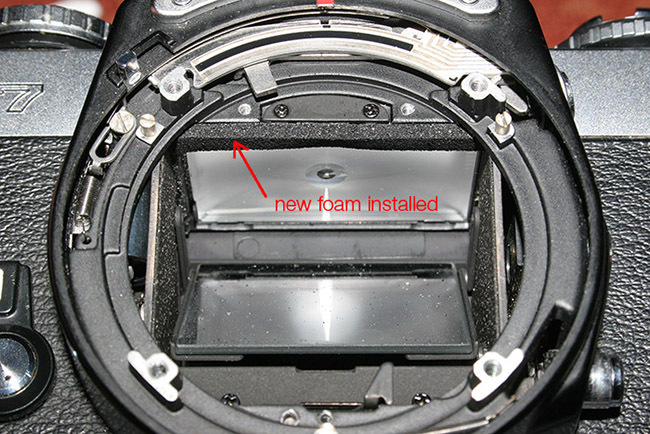 This is because the foam is placed behind a metal plate and thus not so easily accessible. 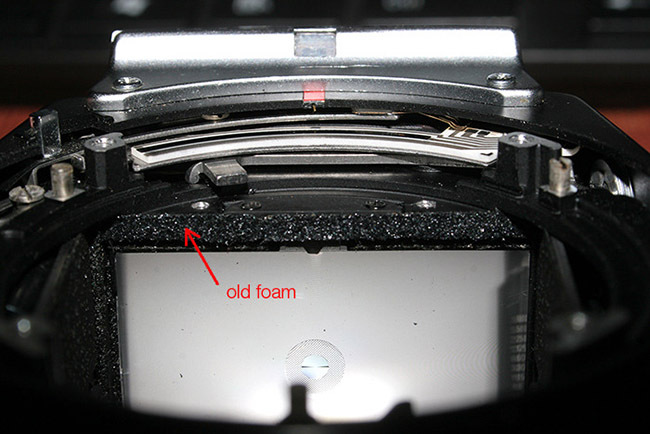 Trying to replace it without removing that metal plate first could actually damage the focusing-screen. Because I didn't want any decomposing foam or isopropylic alcohol reaching the screen, I decided to do a little dismantling job. 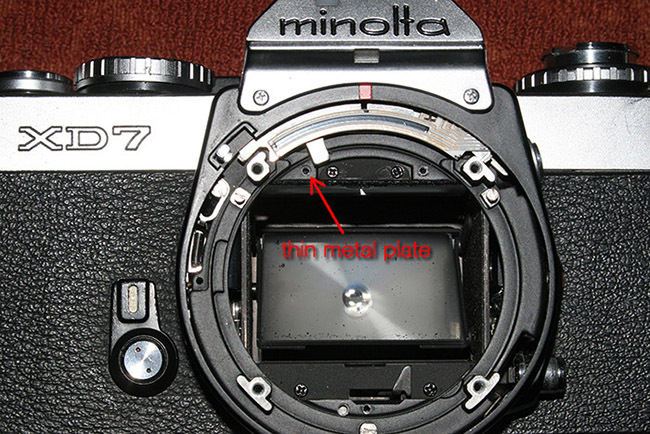 The following tutorial is just the way I did this replacement and I really am just an amateur that has no idea what camera servicing is about. So don't blame me if your camera blows up or something at the end! First of all, the needed tools: Philips 0 and 00 screwdrivers, tweezers, something with a sharp point (I use a dental probe), ear buds, isopropylic alcohol, replacement foam (I used closed cell self-adhesive foam from the last piece I had left from a foam kit I bought a while ago). 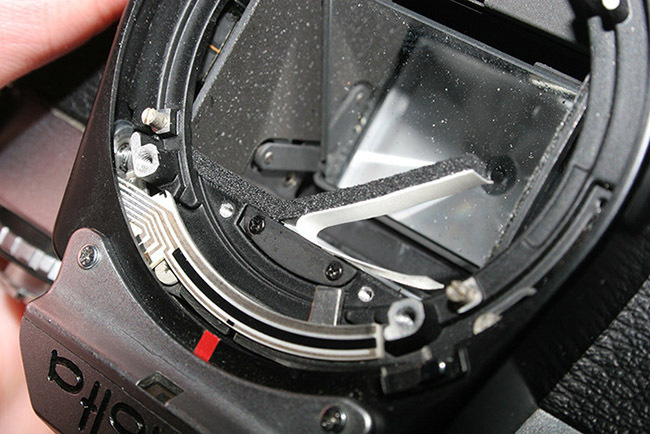 And now to the actual steps... 1. remove the lens mount. there are four philips 0 screws holding it in place. 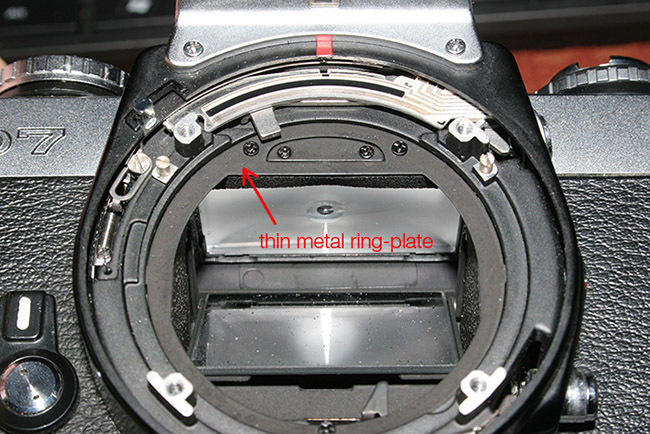 2. underneath the lens mount there's the diaphragm-metering ring, that will most likely come out together with the lens mount. you'll notice there's a spring attached at one end to the metering ring (the U shaped end) and at the other end to a little springy wire (the small circle end). 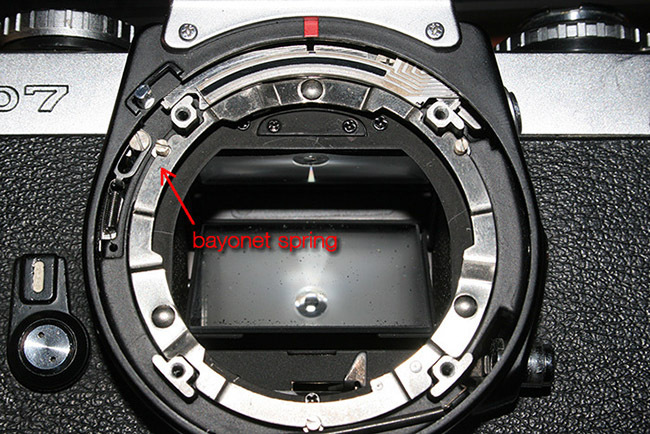 3. after removing this ring you'll have access to the bayonet (lens mount) spring that can be removed right away. 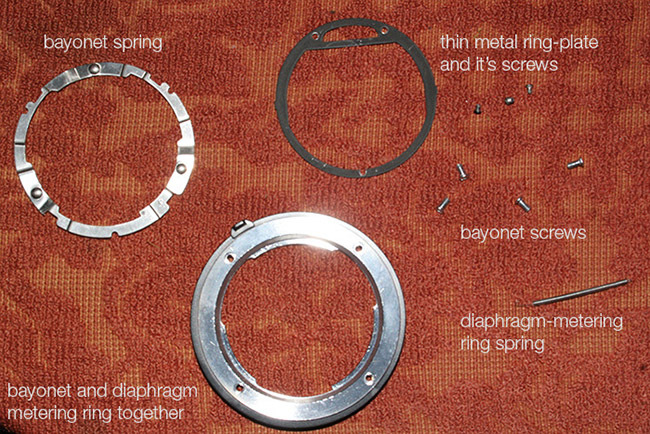 4. next is a thin metal plate, the actual reason for all this disassembly. it's secured in place by 3 philips 00 screws. also notice that it has 2 lateral 'wings' that also secure it in place (it will resist pulling even after the screws have been removed). when reassembling the camera, make sure these wings have been placed underneath the bodycast before tightening the screws! 5. after removing the metal plate you'll have clear access to the old foam dumper. 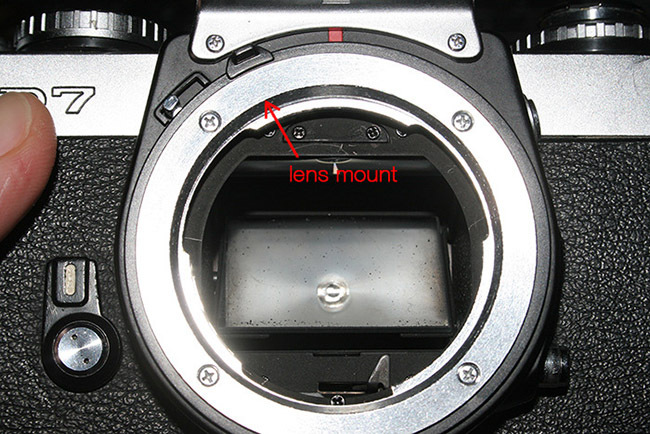 put the camera upside down and tilt it so that the focusing screen is on an upper position than the foam (otherwise there's a greater risk of getting it dirty with foam residue). what I did next was to soak an ear bud in isopropylic alcohol and then rub it gently against the foam a couple of times. then, with the dental probe, I managed to lift it from the metal almost in one piece (it had a self-adhesive backing), leaving the metal clean. no extra rubbing was needed.